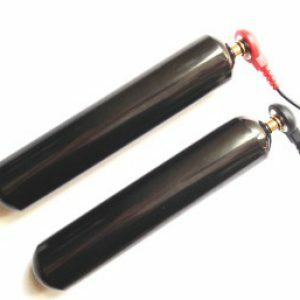 Set of two Shungite Cylinder Attachments with mini-pawns handles. Can be used as vaginal and/or rectal electrodes. 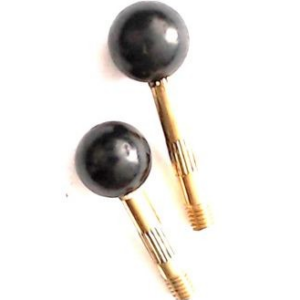 We are delighted to offer you a new exciting addition to our product range – electrodes made out of SHUNGITE. Imagine adding these healing properties to the healing powers of SCENAR! The electro-conductivity of shungite makes it possible. 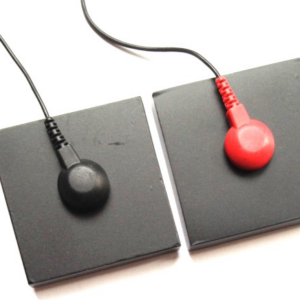 Remote shungite electrodes specifically designed for SCENAR devices are now being manufactured in Europe with patented proprietary technology. Unfortunately, shungite is a really difficult stone to work with, due to its fragility. The manufacturing process results in a lot of wasted material (see the picture on the left). As a result of that (and of the uniqueness of the stone as such), the electrodes turn out pretty pricy – but THEY ARE WORTH IT!